Different geographies and changing weather patterns over the course of a given year resulting in temperature extremes that can make it difficult for some people who work with cranes. That’s because the issue is something that can directly affect crane parts by either causing them to stop working or drastically reduce the lifespan for their usage. Either circumstance can have a negative impact on the financial fortunes of a business, so it makes sense to be aware of the dangers posed in these situations. In a competitive industry like construction, ignoring the potential hazards can end up destroying a business. Warm weather is the friend of construction projects, but too much of a good thing can become dangerous when temperatures reach uncomfortably high levels. This is a regular concern in the Southwest and areas like Arizona, with many daily summer workdays beginning hours before daylight in order to beat regular triple-digit temperatures. Dangers can result when crane engines overheat or regular lubrication maintenance isn’t kept up. With regard to engines, that means that the gauge that monitors the crane for overheating needs to be in working order. Otherwise, a business is looking at least a temporary shutdown, even if crane part replacements are on hand. Also, having cranes situated directly in the line of the sun on a daily basis is detrimental to their potential long-term usage. That problem can be magnified if a trusted source to obtain new parts isn’t readily available. From the perspective of the crane operator, there needs to be a comfort level when operating the equipment under these conditions. Having covers for the controls or seating helps alleviate the issue of having these areas being too hot to touch, with tinted windows also a consideration. In addition, having air conditioning within the cab will not only prevent the possibility of health concerns like heat exhaustion affecting the operator but also stop torrid temperatures from affecting the viability of the equipment inside. 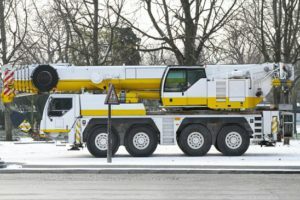 In very cold conditions, the tensile strength of the crane can be reduced, which in the worst cases can cause a crane collapse and led to tragic consequences. That’s because many aspects of the crane’s operation can be negatively compromised, especially when it comes to areas like rigging devices, hoists, and hydraulics. Batteries freezing and the development of ice and snow on the crane can also ground things to a halt. In the latter case, it’s especially important to avoid having the boom affected by the frigid conditions. Once the temperature gets below freezing, these areas start to show signs of stress. That should be a clear indication that the maximum load should be reduced, with listed restrictions indicating that amount to be 25 percent. Once the temperature starts to drop into subzero territory, that number is boosted to a 40 percent reduction, with any lower temperatures resulting in a complete shutdown. For projects that are located in perennially cold weather areas during the winter months, having crane part replacements on hand will help avoid concerns about the rigorous demands that take a toll on crane parts. Craneco Parts & Supply has been around since 2003 and has established itself as a reliable source for crane part replacements. Our knowledgeable staff and extensive inventory, coupled with smooth-running logistics help make sure that the crane parts a business needs will be delivered in a prompt and professional manner. Contact us today for all of your crane needs.